The solution is simple to open the location of a Program in Windows-10 (path, folder)? In this short FAQ you will learn, with various examples, how to get out the location or the directory of a particular program, for example, to create a program shortcut. The examples here is tested and created under Windows 10 but it can be also used for Windows Server 2012 / 2016! 1.) ... Open the program file location over the Windows-10 search! 2.) ... Open the program path via Windows-10 Task-Manager! 3.) ... Find the program file location via MS-Explorer! 4.) ... If the File Location is a Shortcut! See also: ► Autostart folder in Windows 10 ► Programs (x86) Windows 8 / 10? 1.) 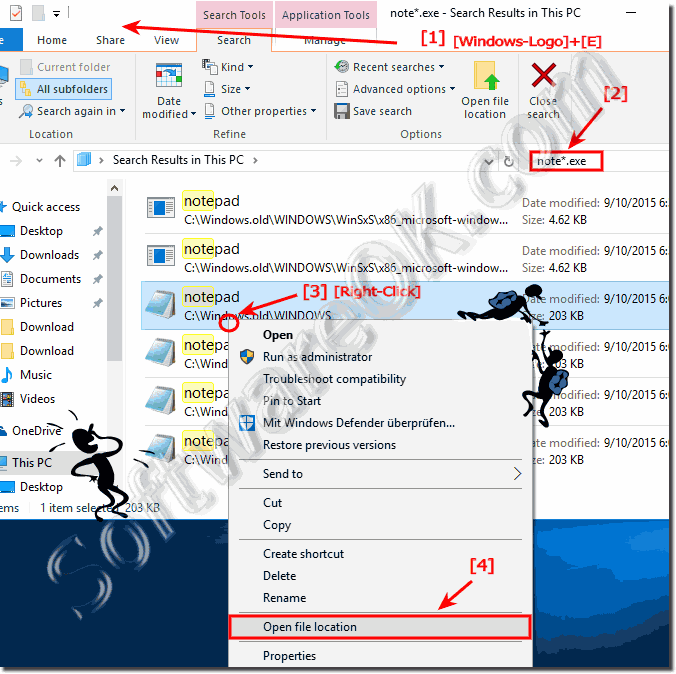 Open the program file location over the Windows-10 search! Via Search Symbol or Windows-Logo + Q keyboard shortcut start the Windows 10 search. Enter in the Search Box for example the text word and do a right click on WordPad, and open the File Location! Tip: ... If the File Location is an Shortcut! (Image-1) Open the location via Windows-10 search! 2.) Open the program path via Windows-10 Task-Manager! 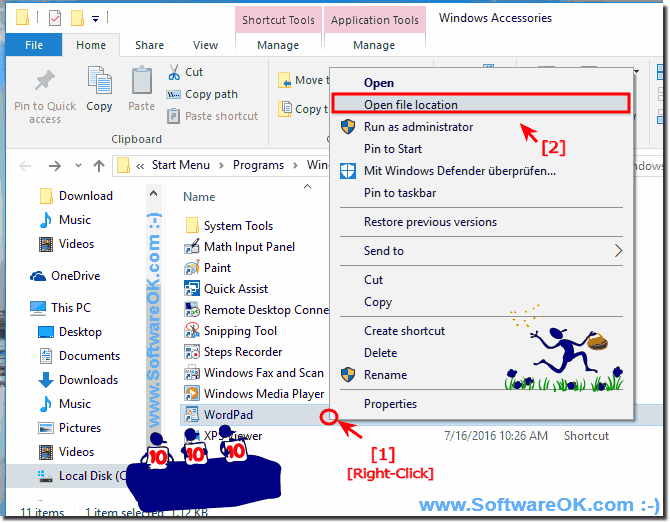 While programs running on Windows 10, it is easy to open the program path via Task Manager. Please use the keyboard-shortcut [CTRL+ Shift + Esc] to start the Windows 10 Task Manager. 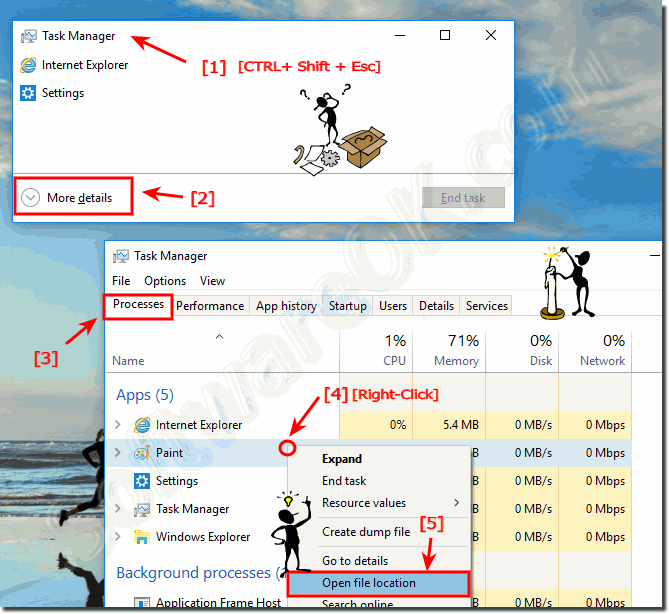 In the Task-Manager click More details and select the Tab Processes. (Image-2) Open the location of a Program in Windows-10 via the Task-Manager! 3.) Find the program file location via MS-Explorer! Please start the Windows 10 File Explorer, for example, you can use the keyboard shortcut Windows + E.
Enter in the search box the name of the program, for example note*.exe do a right click and select "Open file location". Tip: ... If the File Location is a Shortcut! (Image-1) Find location of a Program in Windows-10 via MS-Explorer! 4.) If the File Location is a Shortcut! 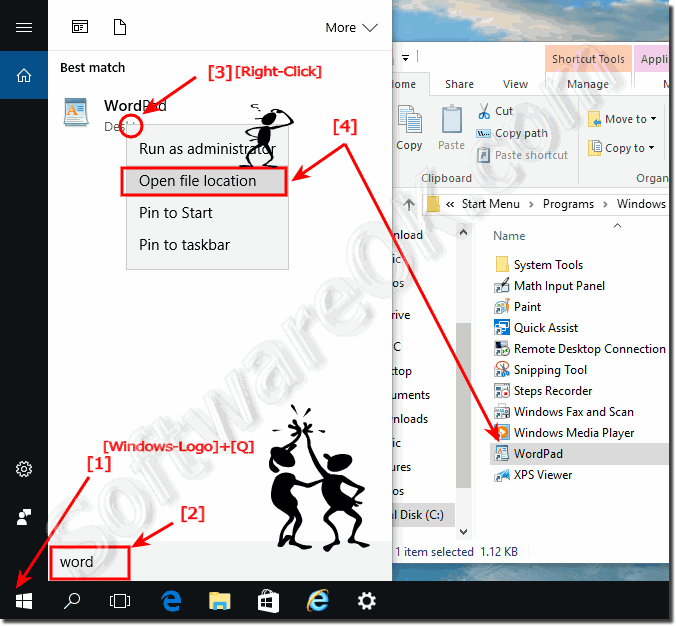 (Image-4) Open the location of a Program in Windows-10 via Shortcut! These solutions to find the location of a program is not only suitable and written as a solution or instruction for Windows 10, even though these screenshots have been made under Windows 10, as you can see above under Windows 10 shot screen photos, you can this example use to locate program folders as a solution without hesitation synonymous apply to older versions of Microsoft Windows operating systems. It does not matter if it's a program folder on a plain Windows desktop computer, or if you're looking for the Program folder on the tablet, Surface Pro / Go. Yes, even a server administrator on the MS operating system sometimes looking for these folders. It really makes sense to use this simple solution to find the folder of the APP or desktop application, it was tested on different MS OS and successfully verified when locating! The solution is simple to stop windows 10 tablet PC from going to auto sleep mode, this solution is also for Windows 8.1 and Windows 7 Content: 1.